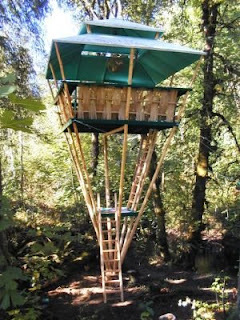 I believe that Jo Scheer from Ashland, Oregon invented this. It's his design for a relatively simple structure that meets the building code's "less than 120 square feet without a building permit" requirement. It has no foundation, no concrete, but guy wires instead hold it in place. 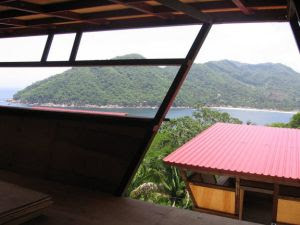 Here's an excert that I took from his website: April, 2006 - A feasiblity study has been initiated for the hooch as a possible safe dwelling for residents of areas susceptible to tsunamis. The recent tsunami disaster, and the likelihood of future tsunamis, has generated research among relief organizations as to how to best rebuild the devastated areas of Indonesia and prevent or at least ameliorate the damage of inevitable future tsunamis. 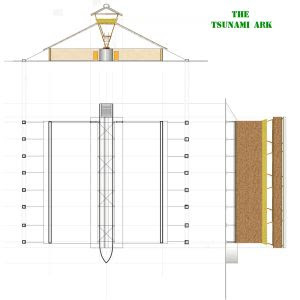 The "Tsunami Ark" uses local bamboo to build tsunami resilient hooches high above the potential wave. The porous nature of the hooch pole structure, and a breakaway foundation will allow the hooch structures to dissipate the energy of the wave, and ride the wave. 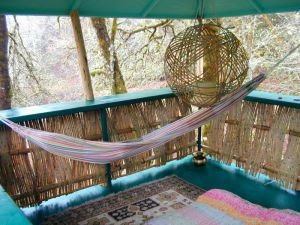 Here's a few sites to go too: Tropical Treehouse, Island Aid, On Youtube and His Blog.